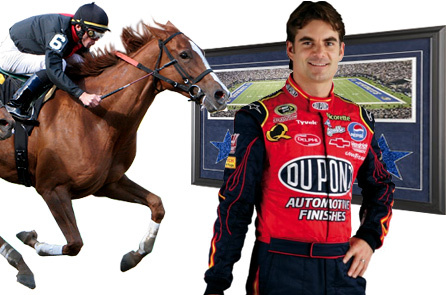 Buy a life-size rendering of your favorite athlete or a piece of the classic stadiums of yore. Kids love big things. And that goes for you kids in your 30s and 40s who haven't outgrown the thrill of seeing Redskins running back Clinton Portis emblazoned on your bedroom wall. Well, better make that your garage wall: Consider Fathead ($149). What is it? Let's go to the P.R. copy: "Fathead is a life-size, hi-def, precision-cut wall graphic made of hyper-durable vinyl." In other words, a really big poster of sports stars. Jeff Gordon, anyone? The sport of kings is now the sport of mooks like you and me. Yes, we can own a thoroughbred racehorse ($499 down and an average monthly stipend of $29). Karakorum Racing Team offers ownership stakes as small as one-half of a percent in a stable of more than 30 horses in New York and mid-Atlantic tracks. You and your 100-or-so co-owners pay for the hay and the shots and the horseshoes, and when your horse wins, you get to stand in the winner's circle (in 2008, about 12.4 percent of the time). Give your nostalgic fan a piece of history by buying a chunk of a dearly departed stadium. How about the general manager's desk from Shea Stadium ($2,500). Maybe a collage featuring a chunk of Texas Stadium's end zone ($500). What about a ballpark seat ($2,750) from the long-gone but never-forgotten Ebbets Field. Rumor has it you can buy a urinal from the House That Ruth Built, but you're on your own tracking down the auction for it. They're apparently going fast.